Dr. Switch prides herself on staying on the forefront of veterinary medicine. That is why we are excited to announce that we now offer laser therapy! Laser therapy is a non-invasive, painless, holistic form of treatment that can help a wide variety of conditions. The infrared laser interacts with tissue at the cellular level, increasing the cells metabolic activity and improving the transport of nutrients across the cell membrane. This process creates an optimal healing environment within the tissue which helps reduce inflammation, swelling, muscle spasms, stiffness and pain. Although some patients see results after one treatment, it is recommended to receive 6-8 treatments to achieve the greatest benefit. 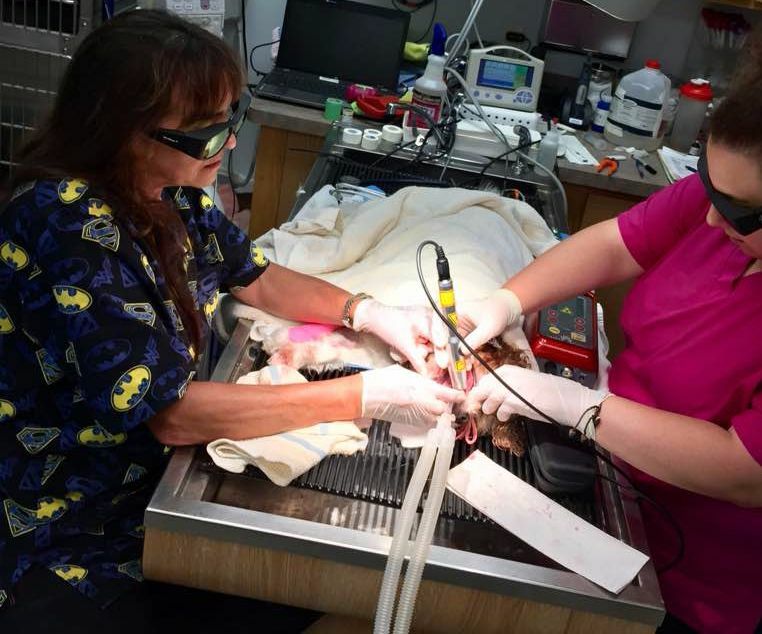 Some common conditions that could benefit from laser therapy are acute and chronic ear infections, intervertebral disc disease, gingivitis and periodontal disease, hip dysplasia, cruciate ligament damage, arthritis and chronic pain, degenerative joint disease, hot spots, cystitis, post operative wound care and many more. **Please note that results may vary case to case. Some animals may need a more indepth treatment plan depending on their condition.